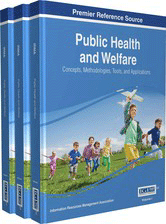 Public Health and Welfare: Concepts, Methodologies, Tools, and Applications provides a comprehensive overview of the latest research perspectives on public health initiatives and promotion efforts. Highlighting critical analyses and emerging innovations on an international scale, this book is a pivotal reference source for professionals, researchers, academics, practitioners, and students interested in the improvement of public health infrastructures. Chapter 54: What Drives the Adoption of Social Media Applications by the Public Sector? Chapter 55: Are Climate Change Adaptation Policies a Game Changer?